The Cono Weeder is a hand drawn tool for farmers to ensure quicker weeding in wetland. 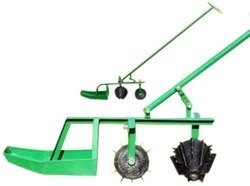 The weeder works in a push/pull motion which uproots and buries weeds into the soil. This ensures in the weeds dying and becoming manure for the crops. In order to retain our remarkable position in this industry, we are providing a wide array of Cono Weeder. Backed by our prosperous industry acquaintance, we present Cono Weeder.